That’s right folks….what once was a bright bubbly bakeshop during the day will now transform into a sleek new lounge featuring cocktails and a menu of small plates . Wine tastings may be in the future as well. As sad as I am to see Veruca Bakeshop go dark, I am excited for the new concept to take form! Mathew Rice and Gerard Craft do amazing things together and I’m sure I’ll fall in love with Niche Taste Bar the minute I take my first bite. Don’t fret though….Mathew will still be doing his famous wedding cakes, confections and cakes. They will need to be pre-ordered through Niche! I am very excited to see the new desserts that come from Mathew in the months to come! Here’s a little scoop: one of Mathew’s fabulous wedding cakes will be shown in a summer issue of Martha Stewart Weddings!! Mathew will also be piloting a new bread program for the restaurant. Now, all the breads will be made in house! I can’t wait to get my chubby little fingers on some of that! Look for Niche Taste Bar to debut this Spring! I’ve noticed some folks have been searching for Cafe Bink in STL….sorry folks…it’s in Carefree AZ. If you ever travel to Scottsdale…it’s just a 30 minute drive north….don’t miss it. But I digress: Lunch at Cafe Bink was delicious….albeit on the spendy side. We knew that going into it though. I’m just not accustomed to dropping $75 on a mid-day meal….but it was worth it. Upon our arrival, Simon was very skeptical. There was a young mother and her two toddler children in the cafe and (as silly as it may seem) Simon dreads eating out with children around….unless they are well behaved. Mean, I know…but it’s a pet peeve of his….and I must say I have to agree with him at times. There is nothing worse than trying to enjoy a great meal with a toddler running around screaming at it’s mother for chicken fingers. But….that is a topic for another day…..
We were greeted at Cafe Bink with house-made foccacia. Wow. It was really good. Had the lovely crust on the outside and was warm and chewy on the inside. Flecks of Fleur de sel were strewn across the top and gave a salty little kick here and there. It was served with a sweet, fruity extra virgin olive oil and balsamic vinegar plate….simple but pleasing. Of course we ordered the famous fries. Now, you have to understand something…..I am not a big potato fan. I like them two ways, whipped with cream and butter or deep fried to a golden brown. I don’t like new potatoes, potato gratin or scalloped….just whipped or in fry form…I know…I know….but it’s who I am. Before leaving St. Louis, we fell in love with the Shaved Duck’s fries….uber shoestring potatoes fried in duck fat. Now….I have said this from the beginning and the boys at the Duck know all about it…..I just wanted the fried thicker cut….I don’t mind shoestring but these were SUPER shoestring and they were tricky to eat….although delicious….I always managed to get them down. The fries at at Cafe Bink (not fried in duck fat mind you) were thicker and friend to PERFECTION! Jesus H Christ…..they were the best pomme frites I have EVER put in my mouth. They arrived in the traditional Parisian fashion (wrapped in newspaper and stuck in the little metal cone)….and were accompanied by 3 different dipping sauces: 1) truffled catsup 2) herbed mayo 3) traditional aoili. Each sauce was beautiful. Don’t need to say much about the truffled catsup…it was simply that…house-made catsup with a hint of truffle. I almost died and went to heaven. (I am a big catsup eater….and truffle lover). The herbed mayo was jam packed with herbs…a bright green concoction with a heavy dill flavor….would go great with fish….and the aoili was light and garlicy…..not heavy or oily…perfect. Next Si had the french onion soup….nothing very fancy but it was executed properly. The gruyere was strong and flavorful….so many times they top french onion soup with chinzy swiss cheese and it has no flavor….not at Cafe Bink….the cheese was great. The soup was rich and almost resembled an onion compote under the crouton. I had a mixed green salad with chevre, dried figs and pancetta. Simple and good. The one thing I must say is that they knew how to dress a salad properly. There wasn’t a pool of vinegarette at the bottom of my bowl…each leaf had a nice touch of dressing and that was it. Simon had a truffled grilled cheese…..talk about decadence. It was one of the best grilled cheeses I have ever had. Not greasy at all! The bread was crispy golden and the cheese was melted just right…..it came with house-made dill pickles and chips…both good as well. We finished off the meal with a strawberry milkshake and some chocolate chip cookies……I must tell you that I am VERY picky about dessert and have been spoiled by one of St. Louis’ best pastry chef’s magical creations…..
now…all Binkley’s needs is a little jonny style stage action……but alas, the man himself is in NYC……playing with the cool kids…. Who made the grade in St. Louis?? Last evening I had the opportunity to attend St. Louis Magazine’s A List Awards Party at Lumen (it is a gorgeous event space…wow). It is not an event I would normally attend. Mind you, at one point in my life, it would have been on the radar. Many of you may not know this, but St. Louis Magazine crowned me one of St. Louis’ Top Singles back in the day….not shabby for a kid from downtown. But, as time passed….I grew tired of the scene….fell in love with the Cheesemonger and left that life behind. So, with being flanked by two tables of pals…the night was sure to be fun. And lucky for us the open bar sat directly across from our table. Nice perk. Along comes Mike Emerson owner of Pappy’s Smokehouse! Mike and I have been chummy since he has opened his doors. We were one of his first customers and I was sure to tell him how much we loved his BBQ. After some more chit chat at the awards event…turns out Mike and I go way back and didn’t even know it. I’ve known his brother Danny my entire life and he grew up with some older members of my family. Pappy’s was being honored for best BBQ in St. Louis….what an honor….open not even ONE YEAR and they are picked for the A List. That was a no-brainer, though. Pappy’s by far is the BEST BBQ in St. Louis….hands down. Don’t fight me on it…you won’t win. And Pappy’s is another place to rush to…..amazing. And before you all shout out ‘favoritism’…..please know that I was singing this joint’s praises long before I actually met Mike and realized his family and mine were close. So zip it. It was a great time. Kevin Willmann, chef at Erato on Main was being honored as well. It was great to see him outside the kitchen! City Hall was representin’ with Mike McMillen and his crew. All the pretty people were out in droves….dressed to kill….and packed in Lumen like little sardines sweating. I was so happy when we ran out of food and could head outside to hang at the Pappy’s table. (they were outside) It was a great night to be outside with a cocktail. Good party St. Louis Magazine….and even better choices for your A-List winners. 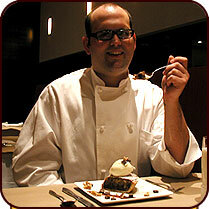 Be on the lookout for St. Louis’ favorite new pastry chef in the upcoming issue of F&W. That’s right, Mathew Rice will be the featured pastry chef for The Last Bite. Wonder what they will feature….some would say red velvet cake….some would say the kulfi….what dessert do you think they will feature? Whatever it is, it will be delicious. Be sure to pick up June’s issue of Food and Wine and support our local chefs! !